From the rear panel view where the back cover casing is located, on the right side of the Samsung Galaxy S Advance body, there is a tiny gap in there. This gap actually a starting point where you can open / remove the back cover casing. Whoever has a strong fingernail, will give an advantage because you need a kind of fingernail to open the back cover from the gap that we shown you above. Insert your fingernail in the gap, press the cover with your fingertip, then lift the cover up until the bottom side of the cover is pull it upward. Whenever the sides of the cover is removed, continue removing all the sides with your fingertip. It's necessary that you must not worry on breaking the rear-cover. The cover is quite strong again your pulling action. If you heard a click sound, that's normal as an indicator that the cover in detached from the body of the device. The location of SIM card slot and microSD Memory card slot are directly under the 5MP camera of Galaxy S Advance. The left slot for SIM, the right slot for microSD. Align the SIM card with its slot with gold-contact facing downward and cut-edge of the SIM on the outside position, the push or slide it into the slot until the SIM perfectly placed and locked on the slot. That's all. You might need to use the back of your fingernail to push the SIM into its slot. Don't worry, the SIM would be OK.
Inserting the microSD Memory card to its slot has similar concepts and steps with SIM card. Align the microSD with the mouth of the slot, make sure the gold-contact facing downward (aka the label-logo of the card facing upwards) then push the card into its slot until it's locked. The Memory card is locked whenever it didn't pop out. To remove the microSD card, you had to make sure that you already unmount it first via Storage Setting. Then you need to unlock or disarming the memory card by pushing it gently until the card's partly ejected. After the card eject, you can easily pull out from its slot. On the package of the S Advanve I9070 (if you got it in brand new condition), the battery isn't ye assembled. The battery uses Li-ion type with 1500mAh capacity. It's removable and replacable. 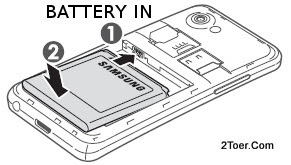 To assemble the battery just align the silver-connector of the battery with metal-connector of the compartment (make sure the SAMSUNG logo on the top), the slide and press the battery until it's perfectly assembled. The last steps on this basic tutorial should be how you could attach back the rear cover of the Galaxy S Advance. Just make sure the hole of the camera on the cover fit with the rear camera, the sides of the body align with the cover, the press the sides down until it's clicked (means locked properly). Done. Actually you don't need this kind of action in your "early days or months" of your usage on this Galaxy S Advance. But in case you had experienced the device is frozen, the touchscreen stop responding, this Factory Reset aka Hard Reset would be help you to solve your problem. Although you have to make sure that nothing gonna lose of your personal data. Therefore, please backup before doing this Hard reset steps. Go to Applications > Settings > Factory data reset > Reset phone > Erase everything. That's it. In case you phone get the first time of stop responding the screen or hangs, it's wise if you just reboot or force restart the device by press the power button for about 12 seconds. It would give you a fast and temporary solution.